When you consider that Windows 8 has been on the market for less than a year, the ecosystem of apps for the operating system is growing at a very rapid clip. 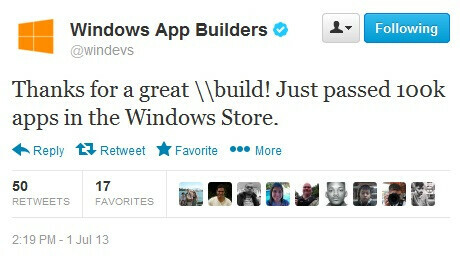 In the wake of the //build/ 2013 conference this past week in San Francisco, Microsoft is hoping to keep the momentum going with the Windows App Builders Twitter feed announcing today that the Windows Store now has over 100,000 apps available. The //build/ conference gave Microsoft the opportunity to re-engage with the developer community and share some of the things we have to look forward to in Windows 8.1, of which a preview is available now. Now we look forward to seeing how Microsoft will further unify the experience between devices. While Windows 8.1 looks like it remedies many of the issues encountered in Windows 8, there are still a lot of concerns about a touch-centric UI on a desktop environment and vice-versa. However, given the progress that has been made thus far, we are pretty excited to see how Windows and Windows Phone environments grow over the next several months. Do you have to pay $2 for a gawd darn flashlight app which can found everywhere in the PLAY STORE for free? I assumed u mean on windows phone? There are free flashlight apps, quite a few. Why do u need a flashlight on windows 8 (pc/laptop/hybrid/tablets)? Those stuff dont even have a flash. Dude this is windows... freaking best os in the world... paying $ for free apps found else where is normal here... and there is no guarantee it will work and there is no return policy... you know MS is miles ahead of everyone else... right wp fans? Why would you need/use a flashlight on Windows 8? I'm assuming you're talking about WP8, so check out Flashlight XT. It's probably the best flashlight app. Simplistic UI and functional. And it's free, so you can't go wrong. Trolls dont really use their brains. They just hate blindly. They think they can force their own opinions on others. And there is no such thing as using flash torch light on windows 8; it;s a desktop/tablet OS. This article clearly stated windows 8. Windows 8 has >100,000 apps; windows phone has >150,000 apps. They are separate. Are there apps in the marketplace that work in the proper desktop? Or all apps in the marketplace just work on the metro ui? It's called "Modern Mix"http://www.stardock.com/products/modernmix/ I have it installed on my computer. Works great. I'm yet to understand why it is called common sense, what an irony? 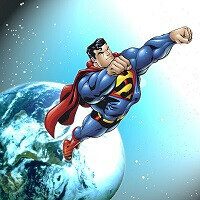 I've being in contact with people, I've interacted with different classes of people and I can tell you for sure that common sense is not common, if anything, it's very rare.